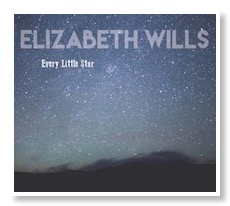 Elizabeth Wills has released her first studio project in seven years titled Every Little Star. The record seems to teem with the beauty and grace that can only be found in the styling’s of a singer with a voice such as Wills, one whose lyrics and vocals are filled with a musical passion. The last seven years have given Wills the opportunity to grow as an artist and experience new insights to write about, which is evident in Every Little Star. The opening track, “Love Come Down,” begins with a sweet melody, and then erupts into a fitting chorus. The guitar adds a joyful theme to the song, while Wills’ vocals make it gentle and calming. Another song “Thank You,” begins with upbeat guitar and many other instruments playing in harmonic unison. Throughout the track, Wills shows her voice’s melodic versatility and exhibits a truthfulness and charm for the small things in life that bring joy. “Long Road Home,” is a powerful song that tells about the long journey that must be taken when reaching one’s goals, and the mistakes that are bound to happen along the way. The release shows a pleasing sound for Wills, and the years between albums have resulted in a beautiful album full of musical stories. 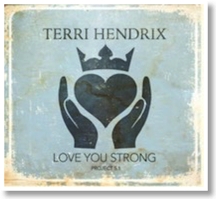 Terri Hendrix recently released the first installment in Project 5, an album titled Love You Strong. Project 5 is Hendrix’s most recent venture in the music world, and is the most ambitious of her career. It will consist of five releases (four albums and one book), throughout 2016. Love You Strong is a wonderful first installment, as it captures the essence of Hendrix’s music in a set of diverse songs. The title track, “Love You Strong,” is when the album comes together, and shows the listener what Hendrix is about. It is an emotional song, with beautiful music to accompany Hendrix’s simple, but talented vocals. The soothing rhythms throughout it definitely earn this song the title track. “Northern Lights” contrasts with “Love You Strong” to show Hendrix’s variety in styles. This upbeat song consists of intense instrumentals, which Hendrix’s voice works well with. “Earth-Kind Rose” is my favorite song on Love You Strong. It tells of a woman who is facing a lot of pain, but Hendrix’s voice seems to comfort her. The song is full of encouragement for anyone who is facing hard times. “Texas Star” pays tribute to Texas’s influential women. Assisting Hendrix with the harmonies is Eliza Gilkyson, another Austin-based folk singer. She and Hendrix have a similar style, and their singing together in “Texas Star” brings out the best in each of their voices. They compliment each other well. Accompanying her on three tracks is her producer, Lloyd Maines. His skill with the guitar and pedal steel bring life to Love You Strong, and he and Hendrix work beautifully together to produce a one of a kind sound. If Love You Strong is any indication of how the rest of Project 5 will turn out, it promises to be a thrilling musical journey.